Starting your own photography business is a very exciting time. This week I have been helping a photographer who is making that leap. He is very excited and can’t wait to put his business skills to the test, along with his photography skills. He has several future bookings, but not enough to guarantee the financial success of his business in its first year. In the course of our conversations we discussed how important it was to keep overhead costs low while the income builds up. I have summarized that discussion into these 7 money tips for when you start your photography business. 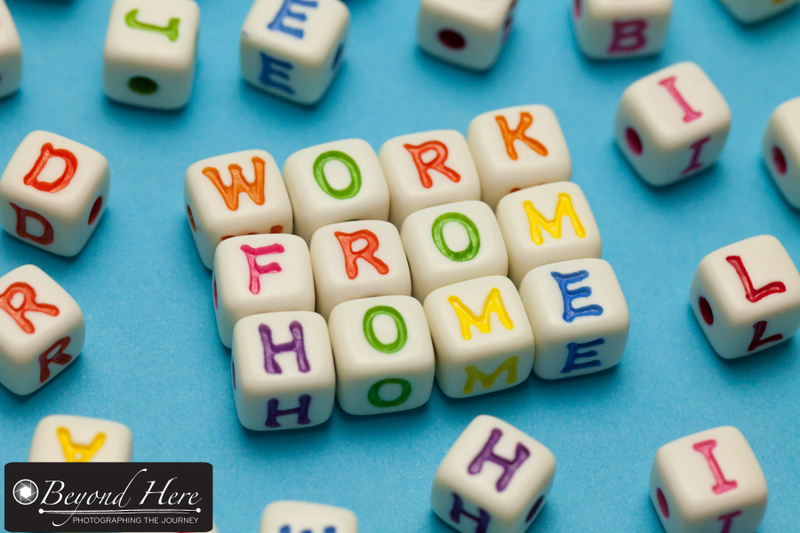 Tip #1 – Work From Home. To keep overhead costs down the most cost effective business premises are your own home. You can effectively set up your business and pay no more for your premises than you are already paying. It might not be a space you want to bring clients to, and it might not be as prestigious as having your own studio on High Street – but working from home is very cost effective and helps to keep your overhead costs low. 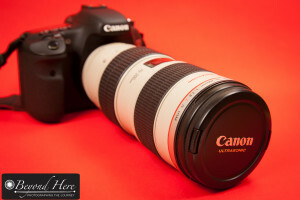 Do you need to buy a new 70-200mm L 2.8 lens? Or could you rent one for the job? Tip #2 – Rent Gear. When you are starting out and have a new project you may not have all the equipment you need. At times like this it is very tempting to go out and buy that new lens so that you can do an expert job. Resist the urge. A smart money managing photographer will resist the urge to buy lots of new gear until they have the cash flow to afford it. In the meantime, rent any additional equipment you need. Tip #3 – Minimize Studio Costs. If your photography business involves studio work, the cost of your studio can have a big impact on the financial performance of your business. It is tempting, and great for our egos, to buy or lease a top quality studio space. Unless you have the client bookings to afford it, a lease on an unused studio space can quickly deplete your businesses cash reserves. Remember the objective is to have a successful business and make studio arrangements that your business can afford. 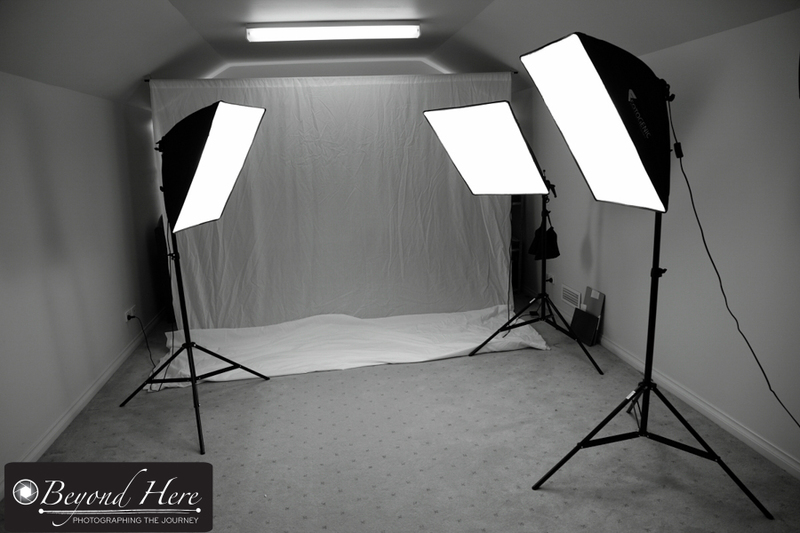 Have you considered renting a studio on a daily or half daily basis? Can you build an effective studio in your home? Will a small home studio be adequate for your young business? 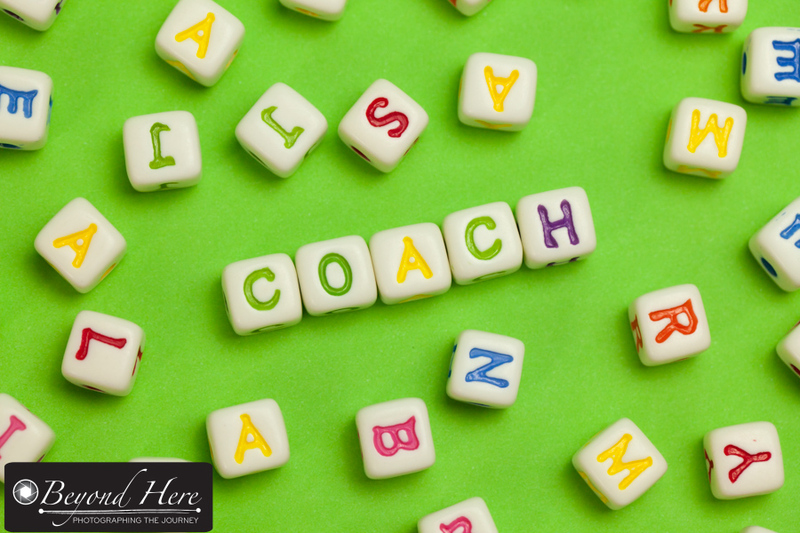 Tip #4 – Go to Your Client. Having your own studio premises makes it very easy to have clients come to you, but can be very difficult to afford when you are starting out. Have you considered the alternative? Go to your clients. Shoot in natural light. Or with portable lighting. Hold your client meetings at their home or their favorite coffee shop. The extra distance you travel will be offset by not losing sleep over lease payments you can’t afford. Tip #5 – Outsource Printing. Are you an expert in the print process? Do you have a passion for the latest print machines? Are you doing enough printing to justify investing in the latest technology? If you do, you are in the minority! If you’re not a print expert, get an expert to do your prints. Let them invest in the latest machines and inks, and pay them for each piece you have printed. Tip #6 – Become an expert in off camera flash. Finally a tip for people wanting to invest in some equipment and improve their skills! Yes, I encourage you to become an expert in off camera flash. It will help you shoot well lit images in a large variety of lighting situations – and at the same time avoid a major investment in lighting equipment. Win, win! You’ll improve your skills and also your income producing potential, without burdening your business with another investment. Remember, when you are starting out, keeping costs down is important while you build the income up. The focus needs to be on achieving business success – not on looking great while your business goes broke. 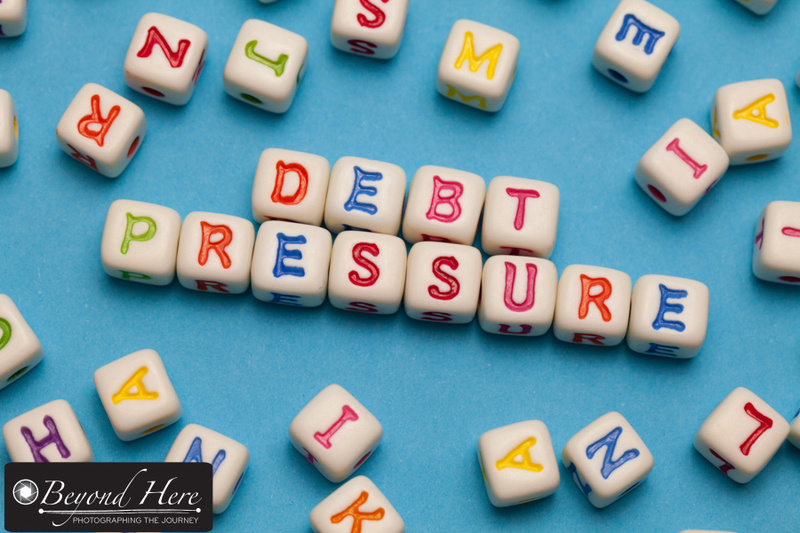 Debt pressure can be crippling for a young business. Use debt cautiously. Tip #7 – Avoid Debt. 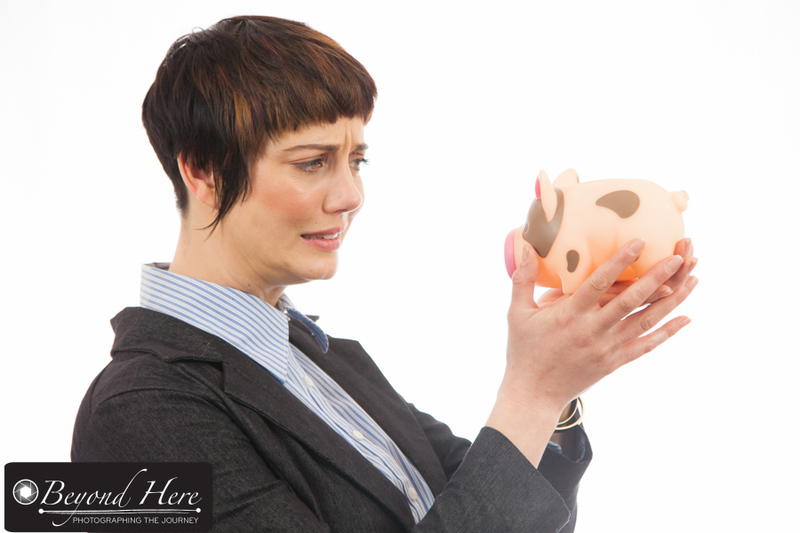 Debt can have a very serious impact on the viability of any young business. Your business will go through good times and bad, and debt adds pressure when times are tough. Your lender won’t be concerned about jobs that are going to materialize soon, they are just interested in getting their money back. Adding debt, adds pressure. Avoid debt if you can. Thanks for reading 7 money tips for when you start your photography business. I hope they have been helpful and will help keep your expenses low while you build up the income. This entry was posted in Business Tips and tagged business tips, photography business, photography business tips on September 22, 2015 by Craig Dingle. Do Stock Photos Keep Selling? As a stock photographer who sells images through iStockphoto and Getty Images I often get asked – do stock photos keep selling? Once you have shot and uploaded your image, will it continue to generate an income for you over time? The theory is that your images could continue selling forever, but is that the reality? I have never been one to spend hours analyzing sales data – I prefer to get on with developing and shooting a new theme. But to help answer this question for other photographers I analyzed the last 100 downloads I have had on iStock. That analysis shows that of my last 100 downloads, a significant proportion were from several years ago. 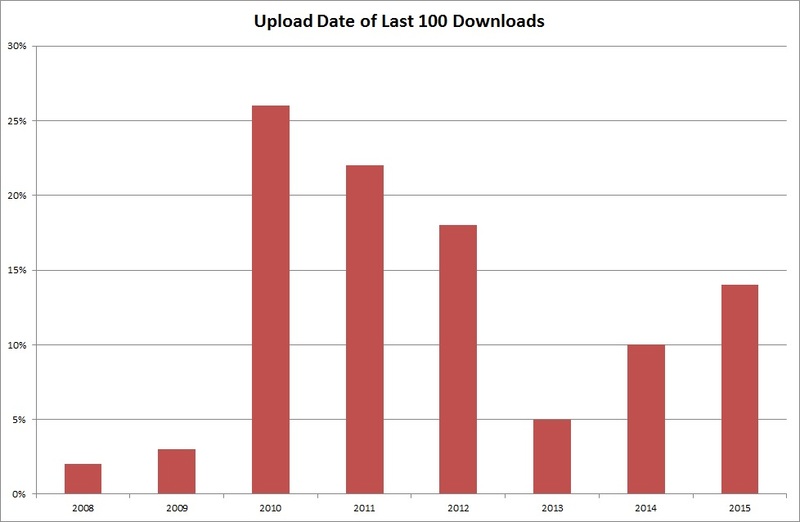 The graph shows that 26 of my last 100 downloads were from files which were uploaded in 2010. If you add in a further 22 which were uploaded in 2011 – that makes a total of 48 of my last 100 downloads which were uploaded 4 to 5 years ago. I was surprised by this. I hadn’t realized what a significant proportion of my downloads were coming from older files. And I certainly hadn’t appreciated that approximately half of my current stock photo income was being generated by files which are 4-5 years old. Presenting the same data in a pie graph you can see the percentages from when the files were uploaded. It is interesting to see how this compares to the relative percentage of files uploaded by year. I have over 7500 images available on iStockphoto. 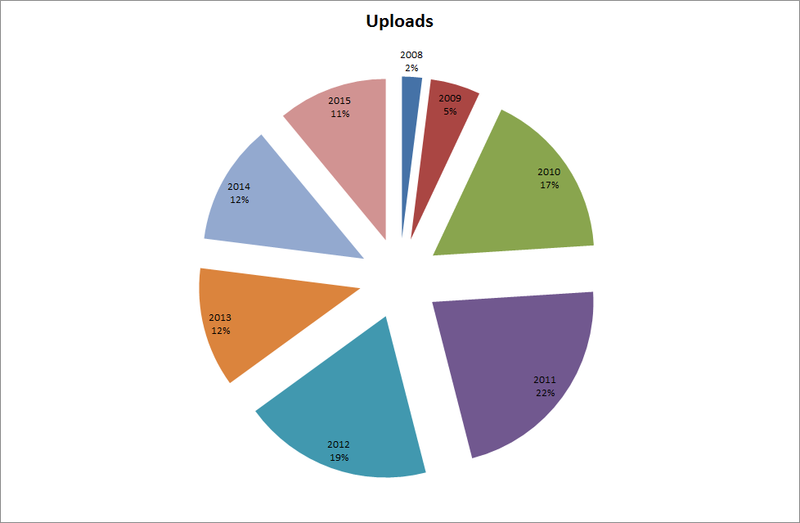 This pie chart shows the percentage of those uploads per year. 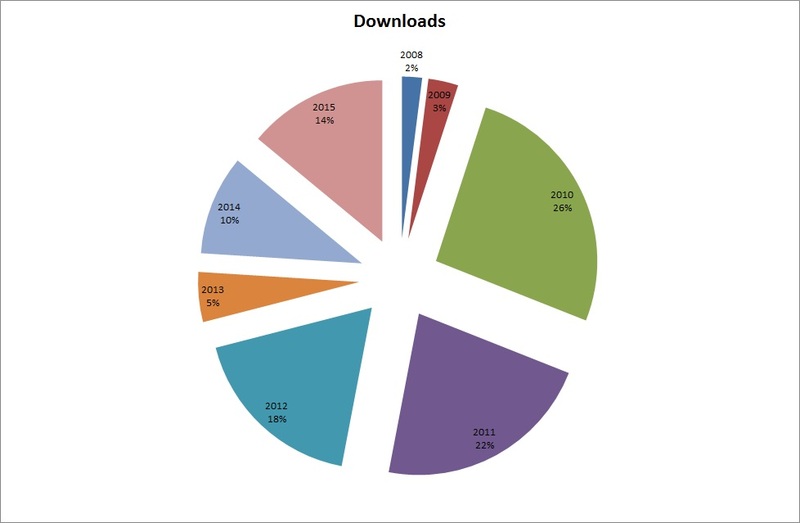 When looking at both pie charts you can see that 26% of my latest downloads came from files uploaded in 2010 – while only 17% of my total files were uploaded in that year. Keeping in mind that this is only one photographers experience and is using a small sample size, what can we conclude from this? And what does it mean? Files do continue to sell for several years. Don’t think that sales of an individual file will drop off within 1-2 years. Keep shooting and uploading quality images. They will keep producing income for several years. As you upload files today, you are building an asset which will generate income for you in the future. Don’t get discouraged if your files don’t get downloaded immediately. Keep building your asset. Current downloads are broadly reflective of the upload quantities in previous years. Keep up a steady pattern of shooting and uploading. There is only a small ‘recency’ effect. Some people believe that new files get better placement in the best match algorithm and so sell disproportionately well. This data doesn’t support that argument. In wrapping up this post, keep in mind this is only one person’s experience and is a very small sample size. Do stock photos keep selling? Based on this analysis, they do. I didn’t realize that nearly 50% of my current stock photography income was coming from images shot 4-5 years ago. Thanks for reading, do stock photos keep selling? For more information about stock photography please see these posts – Why Stock Photographers Should Crash Their Cars, Starting in Stock Photography, Simple Stock Concepts, and Inside a Stock Photography Shoot. This entry was posted in Stock Photography on September 15, 2015 by Craig Dingle. Welcome to the 100th post for Beyond Here! Along the journey so far I have tackled a wide range of subjects including business tips, photography book reviews, wedding photography tips, gear reviews, and many more. I have also written many posts on stock photography as readers look to transition their photography from hobby to income through stock photography. Today, we look at using props in stock photography. Why use props? Props enable images to have a stronger link to a specific theme. In this image, a cute portrait is transformed into an image which displays nationalism or patriotism by using a national flag. Are props expensive? In each of the images in this post, the props I have used are inexpensive. 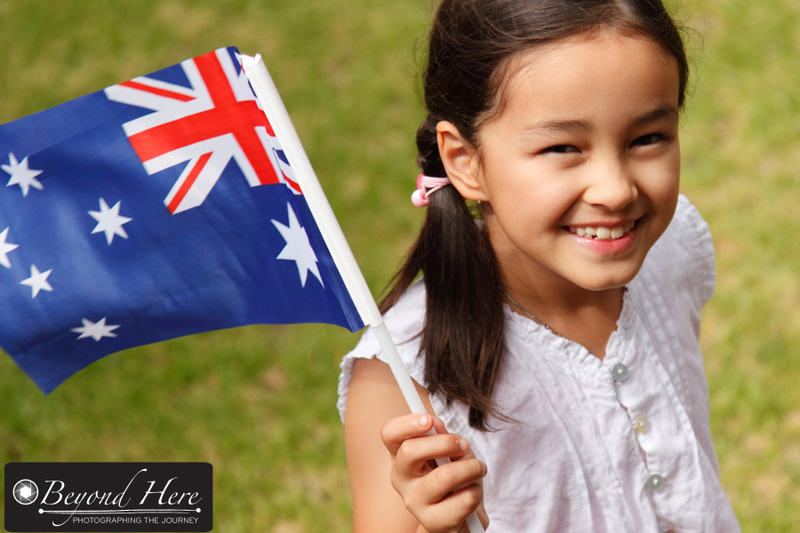 The Australian flag in this image cost $8 at a variety store. Variety stores are a great source of props and many of them are inexpensive. Does using props work? In my experience, using props to create images with specific themes is effective in producing downloads. While more generic images can also be popular, images with clearly expressed themes are more likely to be successful in a world where there is huge volumes of generic images. As you gain experience in working with props, they can be used to create conceptual images to highlight a point. 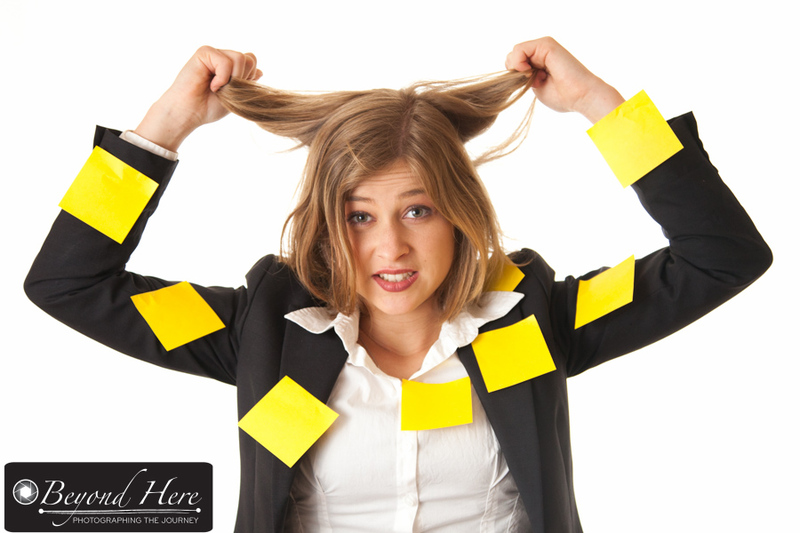 In this image a $1 set of sticky notes has been used to create a concept of business overload, stress, being over scheduled, and tearing her hair out. Do props always need to be used with people? Definitely not! Check out any of the major stock photography sites and you will find an extensive range of images which use props only. They are often used to communicate a specific theme. In this range of simple images, using just alphabet blocks and color – there is an almost unlimited range of images you can create. Where does this type of image get used? An image like this, which has a clear literal meaning and bold color are very popular for use on blogs. They immediately focus the readers attention on the subject and support the text. Don’t forget online uses when you are creating stock images! Thanks for reading about using props in stock photography. Good luck for your next stock photo series! This entry was posted in Stock Photography and tagged iStockphoto, microstock photography, props, stock photography, stock photography props on September 12, 2015 by Craig Dingle.